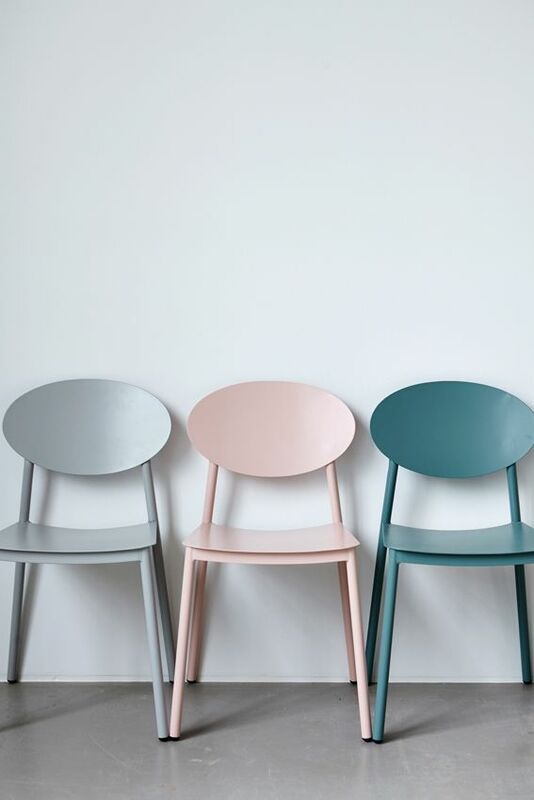 Popping up more and more in minimal Scandinavian design, pastels have long been known for their ability to create a soft, relaxing look and feel in the home. However, when combined with simple, yet modern furniture, pastels look elegant and sophisticated. Paired with shocking bright colors, pastels can create a major impact and a stimulating interior experience. To keep the look neutral (rather than “Easter”) choose pastels that are deeper, grayer and richer in tone. This portrays a very calm and visually quiet look. Use minimal pieces and accents so the tone doesn’t shift from soothing to overwhelming. With so many new pastel options in the market this spring, it can be hard to decide how to incorporate this trend of pastel colors into your home. But, we’re here to help! Below, we've compiled our 5 favorite ways to decorate with pastels. (Plus you’ll find loads of pastel decorating inspiration + images both here + on our Pinterest page). Several years ago, gray overtook beige as the “new neutral” paint color for home (coining the color many fondly refer to as “greige”). However, cool chalky pastels are starting to appear in rooms throughout the home (not just the nursery!) as a new “quiet” color alternative. Known for cheering people up, pastels usually symbolize spring and all the wonderful flowers, smells, colors and feelings of happiness we get as gloomy winter weather transitions to warm and sunny days. However, the newest shades of pastel paint are a richer, hazier hybrid of soft colors and neutral grays that work in every room of the house from sophisticated bedrooms to trendy living rooms and modern kitchens. Furniture is a great way to dabble in adding accent colors to your space. Sometimes it hard to commit to rolling out a lot of color in a room, but by adding color in a few key bursts, you gain visual interest with little effort. To start, pick furniture pieces that are sleek and and small scale. 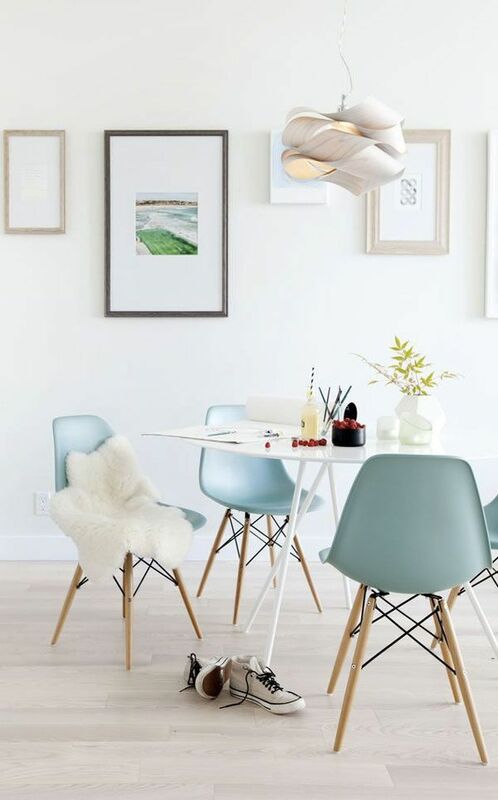 Minimalist, Scandinavian designs works beautifully in pastel colors and pieces like a side chair, ottoman or end table are great test pieces. In this age of DIY, more and more people are finding unique statements pieces at yard sales or antique shops and then fixing them up with a coat of paint or new fabric. Thrifty finds are a perfect opportunity try out adding neutral pastels to your space. Feeling motivated? 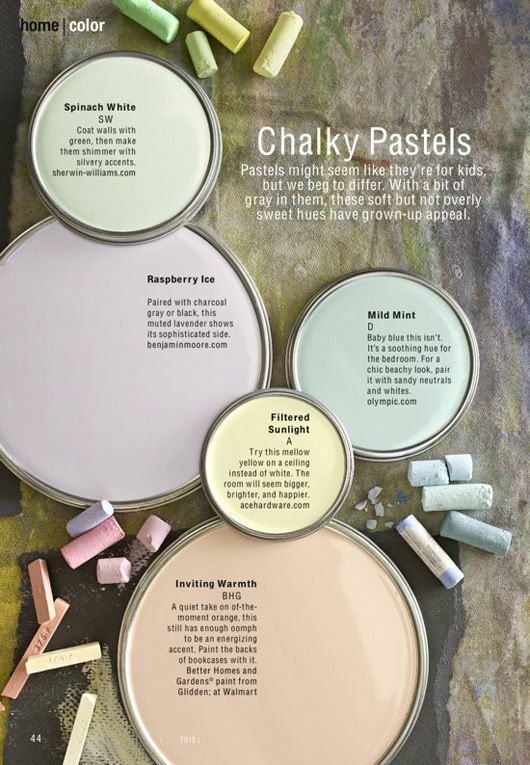 See this DIY tutorial on how to get the chalky paint look for your new found furniture. 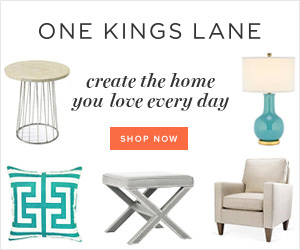 Or see some of our favorite pastel furn(iture) finds below. If your room is heavy on neutral colors already, perhaps gray or white - or even dark tones such as navy or black - adding some pops of pastel is a easy way to instantly update the space. Feeling adventurous? Try mixing two contrasting pastel shades to add some punch to the room. To get started, find a few simple, decorative objects or soft accents in pastel hues such as frames, accent pillows, blankets, candlesticks, rugs (…the list is endless) and place them throughout the room for a quick and easy room refresh. Kitchen appliances aren’t just black, white and silver anymore. Nearly every color of the rainbow is now available for your refrigerator, stove, mixer or blender - including pastels. Nervous about committing to a mint refrigerator? Try a buttery yellow blender or a cool blue coffee maker. Or start testing pastel colors with kitchen utensils such as spatulas and spoons or tabletop staples like plates. 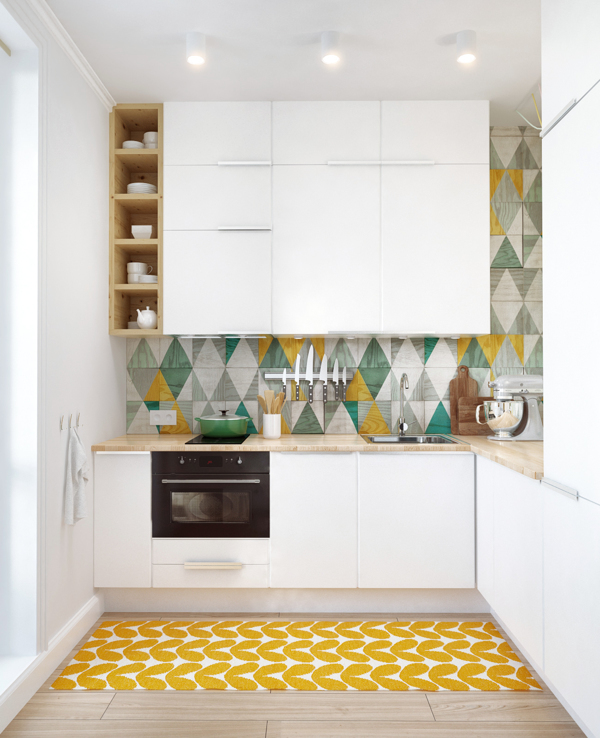 There are a lot of high impact, low investment ways to start transforming a once bland kitchen into an inspiring one! 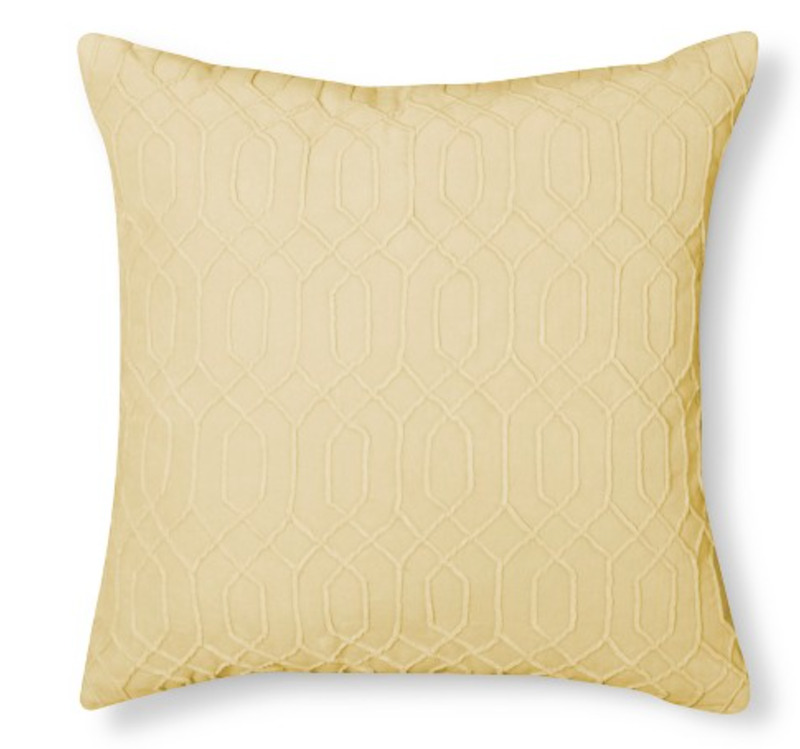 Fabrics are always a quick and easy way to introduce color, texture and depth into a space. If you’ve been craving something a bit more interesting than your traditional white linens, but have been unable to take the leap, then pastel fabrics and textiles are a great option. Busy patterns are muted with a pastel color scheme while chalky blues and hazy mauves offer more visual excitement than your more common beige or gray. 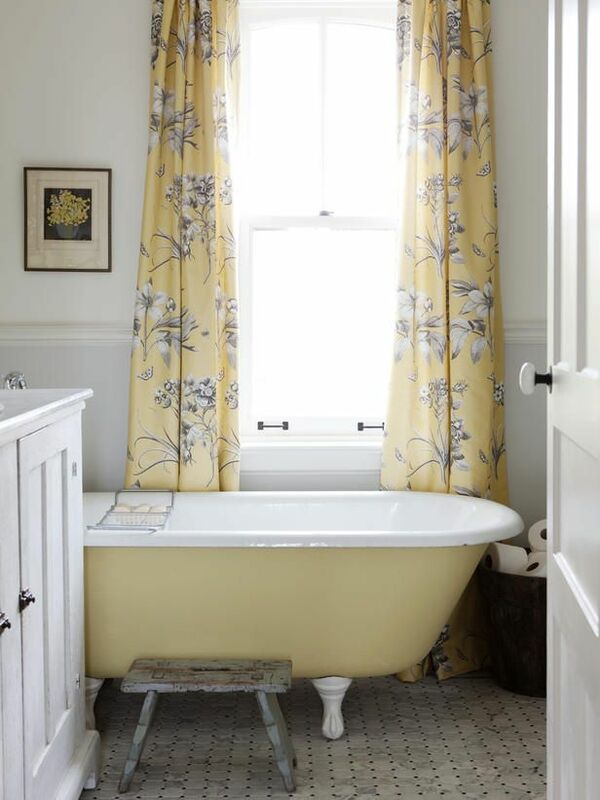 Try adding pastel in curtains in the living room or bathroom. Pastel bedding is a easy way to refresh the look of your bedroom and with so many pastel options, you can find something modern (like a geometric print) or traditional (such as a classic floral). Feeling inspired? Us too! Let us know which approach you try!